Last fall, a team of eleven young reporters, led by veteran environmental journalist Sandy Tolan, gathered in a classroom at the graduate school of journalism at the University of California Berkeley. Their assignment: to identify the places around the world where global warming is already making changes to life and landscape. The team spent the first few weeks poring over thousands of pages of documents on the science and politics of global warming. They made lists of the dozens of places around the world where they might investigate. The science advisor and co-teacher was climatologist John Harte, of U.C. Berkeley's Energy and Resources Group. Under his guidance, the team focused on two conclusions of scientists around the world: first, that the earth's atmosphere is growing warmer; warmer than at any time in recorded history. And second, that this warming is driven in large part by the burning of fossil fuels. Climatologists have essentially reached consensus on both points. The intergovernmental panel on climate change, more than 2000 scientists working in more than a hundred countries, has concluded that global warming is happening and is driven largely by humans. So the team decided not to focus on the false balance in much of the U.S. media - the "Is global warming real?" debate that gives equal weight to unequal sides. Instead, the team took it as a given that the world is heating up and focused on the impact, in human terms, of a warming planet. At the end of 2005, the team of reporters set out from U.C. Berkeley to eight places around the globe and came back with stories about how global warming is already changing people's lives. 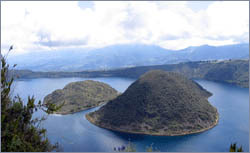 As temperatures rise in the Andes, the glacier atop a mountain in Ecuador vanishes. Creeks are drying up. Lake levels are plummeting. 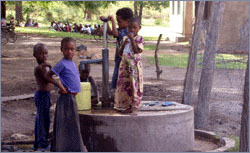 The indigenous people are competing for shrinking supplies of water while they try to understand what is happening. In Tanzania, the legendary snows of Kilimanjaro are in alarming retreat. There, as in Ecuador, farmers are struggling with the changing weather. 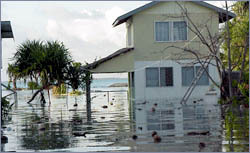 Rising seas represent one of the gravest threats of global warming. A quarter of the ice sheets in Antarctica and Greenland could melt by the end of the century. Residents of Kiribati, a string of islands between Hawaii and Australia, say they're already noticing changes. Some pacific islanders are leaving their homes already. 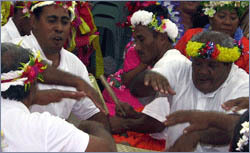 Islanders from one of the world's smallest nations, Tuvalu, struggle to retain their island culture in a modern environment. The effects of rising seas may be even more catastrophic in densely populated South Asia, where tens of millions of people live in low-lying deltas. 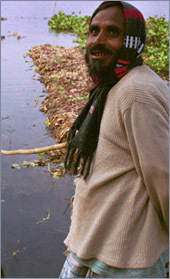 In Bangladesh, people are accustomed to coping with natural disasters. But this one could be different. In northwestern Tanzania, generations of fishermen have lighted the nights with kerosene lamps. 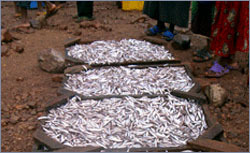 But now Lake Tanganyika is warming, and some signs indicate that a tiny sardine known as dagaa may be in decline. It's a fish millions of people depend on for protein. 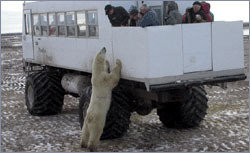 Diminished polar ice is forcing the town of Churchill in Upper Manitoba, Canada, to reexamine whether it has any future as "The Polar Bear Capital of the World." 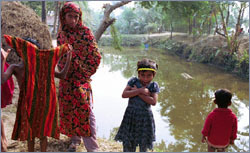 See a slideshow of the effects of climate change in Bangladesh. Reports from a Warming Planet was produced by Elizabeth Chur and Sandy Tolan, with Felicia Mello and the UC-Berkeley Graduate School of Journalism.